Deacon's Corner is owned by Educated Palate, the same three guys who own/operate Cobre down the street - Tyson Reimer, Jason Kelly and Stuart Irving. Tyson's grandfather built the original Deacon's Corner on the Trans Canada Highway outside of Winnipeg. It was a truck stop diner. Tyson's father and uncle grew up in it and took over the business when Tyson's grandfather retired. Tyson also spent part of his childhood growing up in the original Deacon's Corner. Just like his grandfather before him, Tyson built the current Deacon's Corner himself with his own hands. (The above is information that was provided to me from Deacon's Corner PR person). 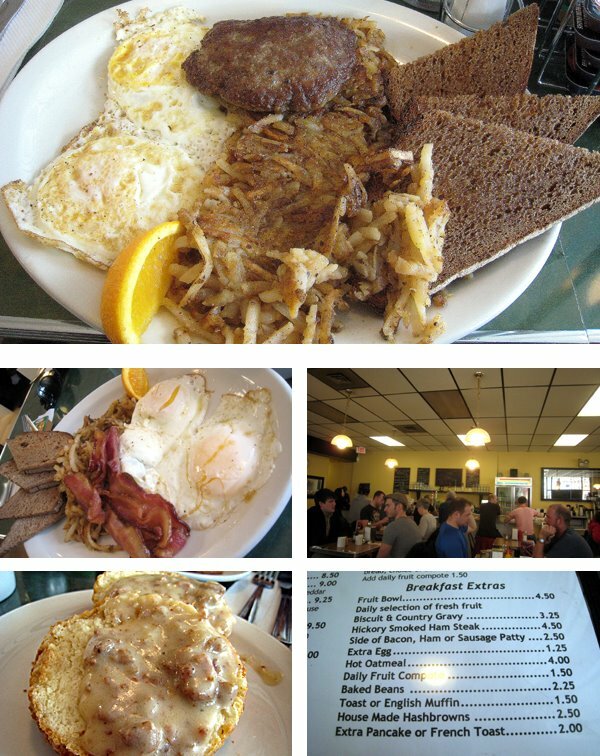 Deacon's Corner offers decent prices and large portions. One of my favorite things about Deacon's Corner is that you can add extras to your breakfast for a very low price. I took advantage of this feature and ordered a side of the biscuits and country gravy ($3.25) to my order (highly recommend). My two egg breakfast was good ($5.75), the eggs were cooked perfectly over medium as requested, the sausage was tasty and acted as a great addition to the biscuits and gravy. I think it is worth noting that the sausage gravy was amazing, it was stacked with pieces of sausage and was just the right thickenss. My only complaint is that I wish I got more. One major gripe my friends and I had was with the hashbrowns. To me hashbrowns can make or break a meal and these joints almost broke it. The hashbrowns had a strange curry taste to them, however the waitress said it can be potentially possible to order regular hashbrowns or just fries (it would depend if the chef had some unseasoned cut potatoes for the hashbrowns). Overall, I am super excited about this place after my first visit, I just need to make sure next time I get different hashbrowns because I was not into these Bollywood remixed potatoes. I was however very impressed with their clean interior, excellent location, good friendly service, and decent sized portions. This could become one of my new regular spots for breakfast. Corner of Alexander and Main Street. Love this place too but jury still out on hbrowns -- way undercooked and flaccid first time better next but still inconsistent and quite picante (thugh no curry flavour). Would drive over a close relative in a semi to get one of them thar biscuits :-). Someone needs to either clean the grill or change the formula because the curry-flavoured hashbrowns are not good. Thumbs up for the french toast with fruit compote. It's huge! Overall, good value but seriously, the hashbrowns need to go. Biscuit and gravy are worth trying too. Was gonna try the place. Lucky for us as it was not busy at all so we looked forward to having breakfast. Tried to get a booth as there were two of us. Told that booths were for groups of 4-6 only. Adjoining booth only had two sitting in it, so politely requested to sit at a booth. Told "no way", so we said thank you and started to leave. Waitress gave a rude hand gesture towards us. Too bad, we won't be back.